- The sharp blade is made of high quality stainless steel. - Unlock protection prevents children from using it. - The free hidden nail file stored in the handle will allow you to polish the sharp nails to perfection. - Safe stop blades greatly reduce the risk of cutting nails. - Ergonomically designed non-slip handles are sturdy, lightweight and comfortable. - Hold your claws firmly when trimming your nails. Quickly cut off the top of the nail at once. - Make sure the handle at the bottom of the file smoothes the nails. - Don't cut too much every time. If the pet's nails are long, cut a small amount and wait about a week to ten days to cut again. Repeat weekly or ten days until the nail reaches the desired length. - Do not use it other than pets. - Beyond the child's touch. - If you have any questions, please feel free to contact us. Recommended by professionals: Boshel Pet Nail Clipper is an ergonomically designed and easy to use pet grooming tool. Animal trainers, veterinarians, professional pet groomers and thousands of satisfied customers recommend the use of nail trimmers. 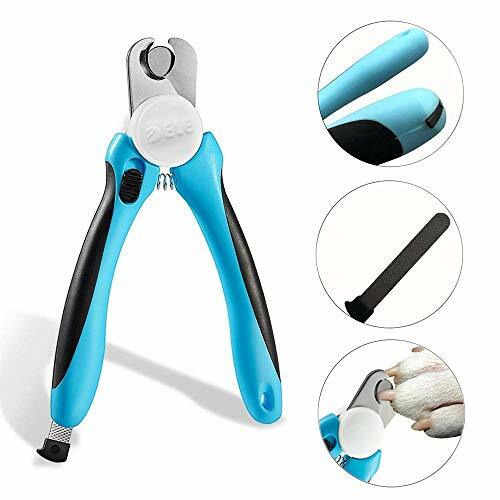 As the best pet nail clippers for large and medium dogs and cats on Amazon. Every cleaning cut: Pet nail clippers are made of high-quality 3.5 mm thick stainless steel sharp blades, which are powerful enough to trim your dog or cat's nails in one cut, and it will remain sharp for years to come. Pressure - free, smooth, fast and sharp cut. User-friendly design: The ergonomically designed non-slip handle is sturdy, lightweight and comfortable. The sharp blades are made of high quality stainless steel. Unlock protection prevents children from using it. Safe Stop Service as a fast sensor: Dog grooming scissors are safely equipped with a safety stop blade that greatly reduces the risk of cutting nails too short and hurts your dog by quickly cutting in. Surprise: Includes a free mini nail file that is used to cut the sharp nails behind your dog and cat's nails, which are comfortably placed on the left handle of the scissors.